Simultaneous interpretation earphone is available for this meeting. 100RMB as the deposit will be necessary and refunded after the return of the earphone. In case of any loss or damage of it, the compensation shall be a must ad valorem. Carriage of handbags or kitbags is strictly prohibited according to the requirements of the meeting venue. Please set the mobile phone in a muted state during the meeting. Please fetch the souvenir after the meeting only with your filled-out questionnaire. Should you have questions, please call at 8610 - 58963535. 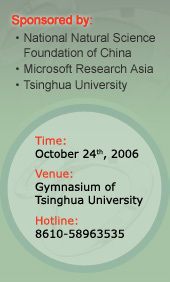 © 2006 Microsoft Research Asia All rights reserved.